After having spent close to 100 hours working, the 114 year old painting is nearly restored. Thanks to Anne Zanikos and her team, the painting “Ben Milam Calling For Volunteers” can return back to the shrine next month. Painted by Harry Arthur McArdle in 1901, his descendants donated it to the Alamo Hall at some point before 1970, though it is not known exactly when. In 2000 it had been put into a vault because it was in too poor a condition to be displayed. The work on the painting was able to be carried out thanks to a grant for $5430 from the Elizabeth Huth Coates Charitable Foundation. According to Anne Zanikos, there are now exquisite details of the painting that are emerging from the damage endured due to previous conservation efforts. Whilst it’s rare that a 114 year old painting would have never been restored, previous efforts had not been kind and the painting wasn’t in very good shape. 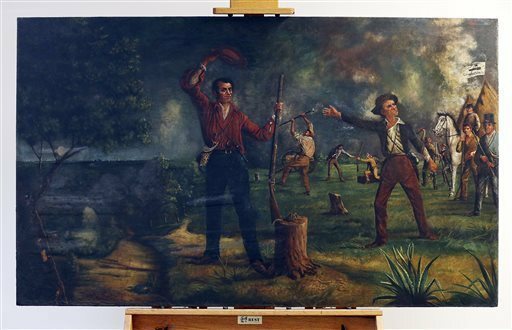 The painting’s repair is important to Texas because of the historical moment it depicts. The painting shows Milam, a Texian soldier persuading the other soldiers to renew their assault on the Mexican army in 1835. At that time, they were deciding whether to keep fighting for their independence or to go home. Over 300 of them stayed and became a part of what is now known as the 5-9 Battle of Bexar, where they forced the Mexican to surrender. The value of the painting is currently unknown, historically it is an important piece of work. Zanikos restored the painting by using adhesive to reader the flaky paintwork and solvents to clean it. After the restoration was finished, the painting was mounted onto an aluminium-skinned honeycomb panel to insure it experiences no further damage.